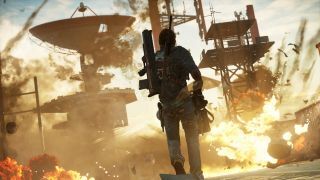 Update: A spokesperson for Square Enix has told techradar, "It is standard practice to register domain names in case there are any future plans for these franchises." Original: Square Enix may be planning to make a number of its long-running franchises into mobile puzzle games, in a similar vein to Hitman Go and Lara Croft Go. Domain names for Just Cause Go, Deus Ex Go, Life is Strange Go, Thief Go and Tomb Raider Go have all been spotted online. They were caught by a NeoGAF user who noticed the registrations were made using CSC Domain Tools. That's the way Square Enix has registered domain names in the past. It may be that Square Enix has registered the domain names in an effort to protect the brand titles, but it could also mean there are more mobile titles coming in the Go Series. If so, we'd expect them to launch for both Android and iOS, like the last two Go titles. Both Hitman Go and Lara Croft Go have been an interesting introduction into the world of mobile gaming, turning the franchises toward puzzle mechanics and away from traditional action elements. Life is Strange Go could offer a board game with an interesting time travel mechanic, although we've no idea what Just Cause would look like in a less chaotic environment.